The permissions policy of the role that is being assumed determines the permissions for the temporary security credentials that are returned by AssumeRole, AssumeRoleWithSAML, and AssumeRoleWithWebIdentity. You define these permissions when you create or update the role. Optionally, you can pass a JSON policy as a parameter of the AssumeRole, AssumeRoleWithSAML, or AssumeRoleWithWebIdentity API operations. This session policy limits the permissions for that for the role's temporary credential session. You can use the role's temporary credentials in subsequent AWS API calls to access resources in the account that owns the role. You cannot use the session policy to grant permissions that are in excess of those allowed by the identity-based policy of the role that is being assumed. To learn more about how AWS determines the effective permissions of a role, see Policy Evaluation Logic. The policies that are attached to the credentials that made the original call to AssumeRole are not evaluated by AWS when making the "allow" or "deny" authorization decision. The user temporarily gives up its original permissions in favor of the permissions assigned by the assumed role. In the case of the AssumeRoleWithSAML and AssumeRoleWithWebIdentity API operations, there are no policies to evaluate because the caller of the API is not an AWS identity. You can use the AssumeRole API operation with different kinds of policies. Here are a few examples. In this example, you call the AssumeRole API operation without specifying the session policy in the optional Policy parameter. The permissions assigned to the temporary credentials are determined by the permissions policy of the role being assumed. The following example permissions policy grants the role permission to list all objects that are contained in an S3 bucket named productionapp. It also allows the role to get, put, and delete objects within that bucket. Imagine that you want to allow a user to assume the same role as in the previous example. But in this case you want the role session to have permission only to get and put objects in the productionapp S3 bucket. You do not want to allow them to delete objects. One way to accomplish this is to create a new role and specify the desired permissions in that role's permissions policy. Another way to accomplish this is to call the AssumeRole API and include a session policy in the optional Policy parameter as part of the API operation. The resulting session has only the permissions granted by both the role's identity-based policy and the session policy. Note that this policy cannot be used to elevate permissions beyond what the assumed role is allowed to access. 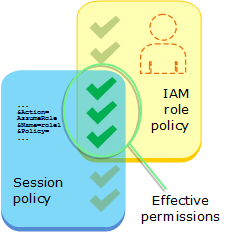 For more information about role session permissions, see Session Policies. List all objects in the productionapp bucket. Get and put objects in the productionapp bucket. In the following session policy, the s3:DeleteObject permission is filtered out and the assumed session is not granted the s3:DeleteObject permission. The policy sets the maximum permissions for the role session so that it overrides any existing permissions policies on the role. Some AWS resources support resource-based policies, and these policies provide another mechanism to define permissions that affect temporary security credentials. Only a few resources, like Amazon S3 buckets, Amazon SNS topics, and Amazon SQS queues support resource-based policies. The following example expands on the previous examples, using an S3 bucket named productionapp. The following policy is attached to the bucket. When you attach the following resource-based policy to the productionapp bucket, all users are denied permission to delete objects from the bucket (note the Principal element in the policy). This includes all assumed role users, even though the role permissions policy grants the DeleteObject permission. An explicit Deny statement always takes precedence over an Allow statement. For more information about how multiple policy types are combined and evaluated by AWS, see Policy Evaluation Logic.